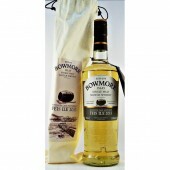 Bowmore whisky distillery is on the Isle of Islay off the west coast of Scotland. Located on the east shore of Loch Indaal facing Bruichladdich across the bay. 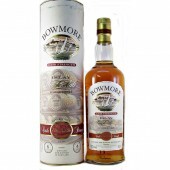 The Bowmore (bow-moor) distillery is kept in immaculate condition by its owners Morrison Bowmore (Suntory) have been distilling complex smokey phenolic single malt whiskies for over 200 years. 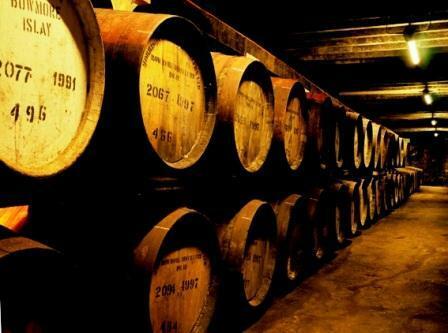 The distillery also matures or finishes its whisky in wine or sherry casks for a rich spicy peaty malt whisky. 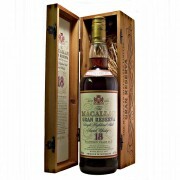 Old discontinued malts and limited edition whiskys are always popular with collectors. Founded in 1779 by John Simpson and so has claim to being the oldest “legal” distillery on the island and the twelfth oldest distillery in Scotland. John Simpson also managed the nearby, long gone, Tallant Distillery. When the journalist and author Alfred Barnard visited Bowmore during the 1880’s it was the second most productive distillery in Islay after Ardbeg. There were 12 legal distilleries that existed on the island at that time. 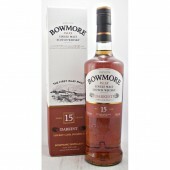 Bowmore was sold in 1890 to a group of London businessmen who formed the company Bowmore Distillery Limited. 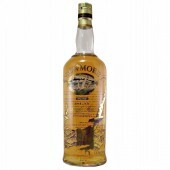 During 1925 the distillery became Sherrif’s Bowmore Distillery. Passing to the Distillers Company Limited (DCL) in 1929. The distillery was taken over by William Grigor & Sons Ltd in 1950. Stanley P. Morrison bought the distillery in 1963 for £117,000 (= £240.000 at 2016 values). Becoming Morrison Bowmore Distillers Ltd. 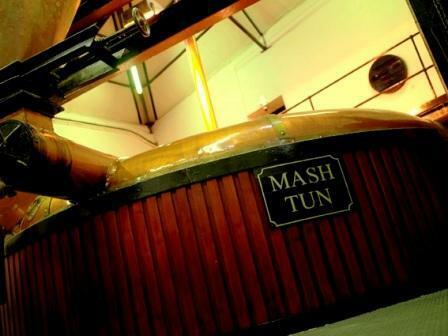 They made several upgrades to the site and also restored the mash tun, which still is in use today. In the middle of the 1960’s Jim McEvan joined the Bowmore staff, becoming the Distillery Manager in 1984. 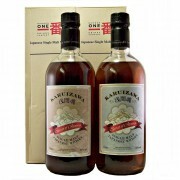 He is credited as the main contributor to the distillery’s successes during 1980’s and 1990’s. During 1970 Morrison Bowmore Distillers Ltd purchase the Highland Glen Garioch (glen-gee-ree) Distillery . They go on to purchase the lowland Auchentoshan Distillery in 1984. During 1989 Japanese Suntory buys a 35% stake in Morrison Bowmore. Ian McPherson became distillery manager in 2000 when Jim McEvan left to manage the neighboring Bruichladdich Distillery. 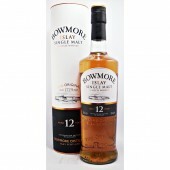 In 1994 full control of Morrison Bowmore Distillers Ltd passed to Suntory of Japan. 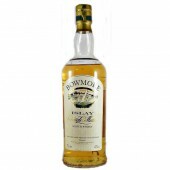 Bowmore is the largest town on Islay with approximately 1000 inhabitants. One of the distillery’s warehouses has been converted into a swimming pool and is heated by secondary heat from the distillery; this has resulted in the distillery being awarded several environmental prizes. Founded in 1779 by John Simpson. Location Islay region. Loch Indaal Bowmore district. 3 Malting Floors and kilns still in use. Wood encased, Copper Domed 8 Ton Stainless Steel Mash Tun. 6 Oregon Pine Washbacks, With 6*48 hour short fermenting time. With 7* 100 Hour long fermenting time. 4 Pot Stills- 2 Wash, 2 Spirit, No two identical, Single union, With three internal and one external condenser. (Forthes of Rothes). Matured in American Bourbon and Spanish Oloroso oak casks. 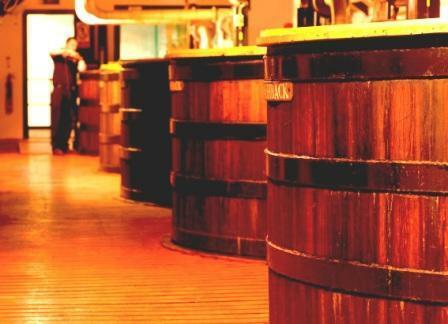 Other casks are used for finishing. The Bowmore distillery still operates its own floor maltings where the peat is crumbled before its fired to give more smoke than heat. The malt is also “peated” for a shorter period than the more heavy Islay whiskies. 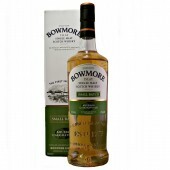 Bowmore is a complex dram with slight smoke and is sweetly aromatic. This positions the Bowmore whisky, taste wise, nicely between the gentler Bunnahabhain In the north and the South shore distilleries of Ardbeg, Lagavulin and Laphroaig. The core range for the UK market Includes; Small Batch Reserve, 12 year old, Darkest 15 year old, 18 year old, 25 year old. Previous limited editions and discontinued whisky of Bowmore single malt whisky expressions are very collectible and much sought after. These include Ceramic, Feis Isle festival, Screen print bottlings. 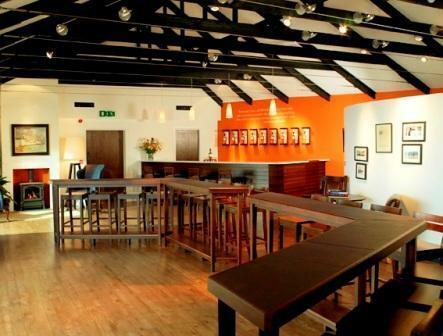 The Bowmore distillery visitors centre is well worth a visit and regularly run guided tours of the distillery throughout the course of the day. A number of the tours include tasting sessions where you can sample some of the drams they have to offer.